The exhibition of the year is here! Isabella Blow: Fashion Galore! showcases the extraordinary wardrobe of the late British fashion editor and style icon at London's Somerset House. 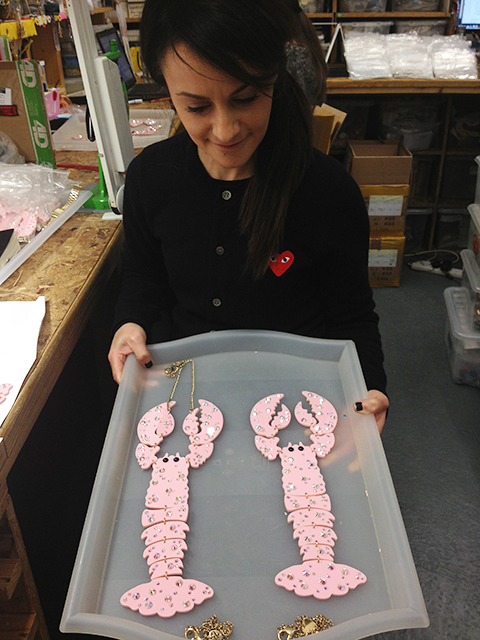 Rosie and Harriet have long been inspired by Isabella's strong fashion identity, so we were really excited to be asked to create "Issie's Lobster Necklace", a limited edition pink Lobster Necklace in homage to her unique style. 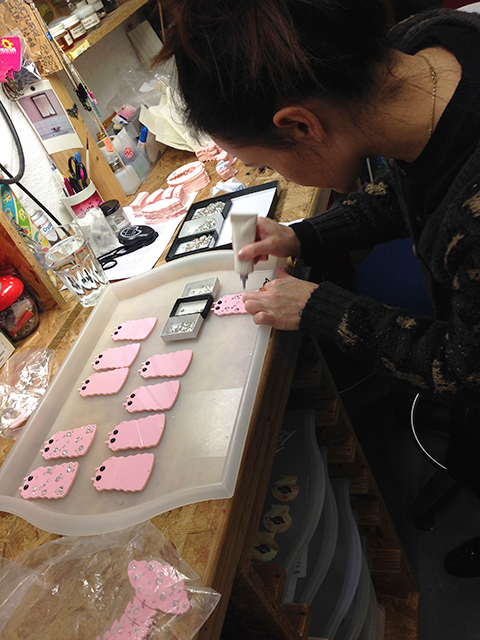 Take a sneak peek into our East London studio to discover how it came to life in this behind the scenes blog... After plenty of sketching, research and playing with crystals, Harriet settled on a perfect pastel pink Perspex for our lobster's body. 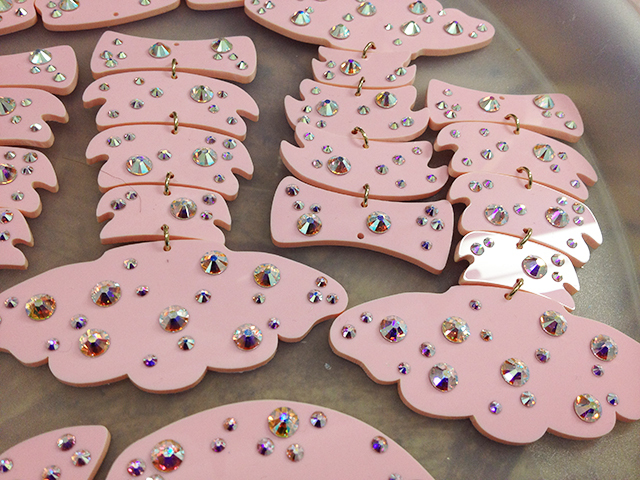 Each piece was laser cut in our East London studio and hand finished, ready to be studded with over 70 glittering Aurora Borealis crystals. 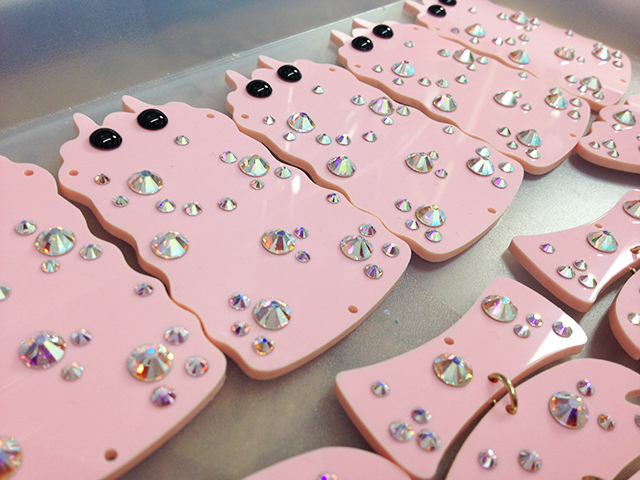 They have an iridescent finish, so there's a magical twinkle to every single one. Oh, and each lobster is accessorised with a pair of glossy black cabochon eyes, too. Senior Jewellery Maker Annick is the queen of crystals (watch her in action here! 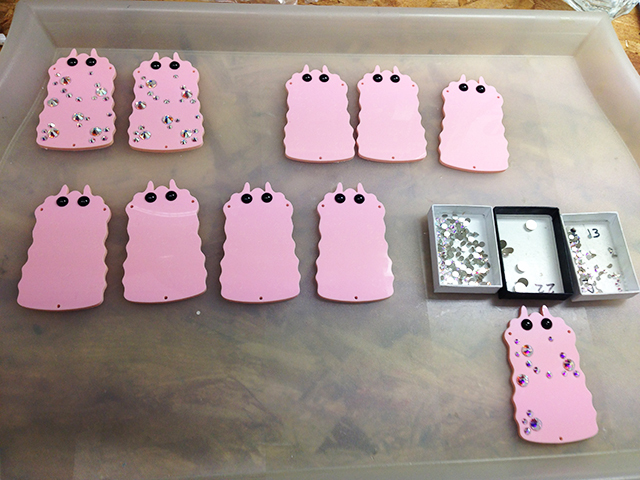 ), so who better to add a touch of Swarovski sparkle to our crustaceans? You need a steady hand and a sharp eye to make sure each crystal is perfectly placed - something Annick definitely has! Ten hours later... Get a load of those tails! Time for a little brush down to remove any dust or residue... "I'm ready for my close up... Ooh, that tickles!" Ta-da! Annick proudly shows off her handiwork before they swim off to Somerset House. What do you think, Tatty fans? Would you channel the spirit of Issie and wear a GIANT pink Lobster Necklace? Rosie and Harriet headed to the glittering exhibition opening last night (bumping into Grace Jones and Phillip Treacey) and snapped our crustaceans on display. 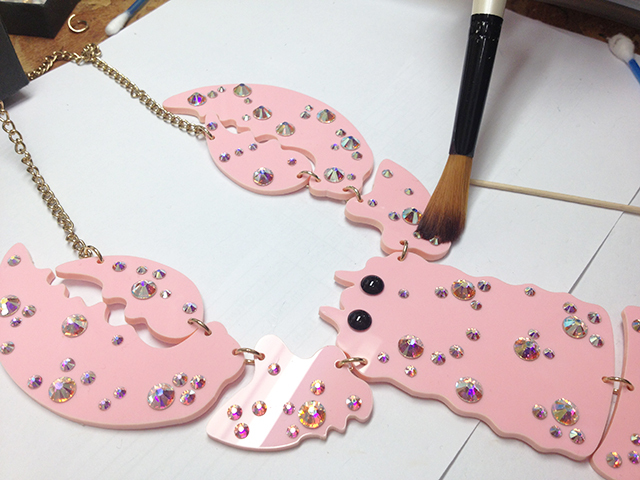 Yes, you can even get your hands on a smaller pink Lobster Necklace, too! 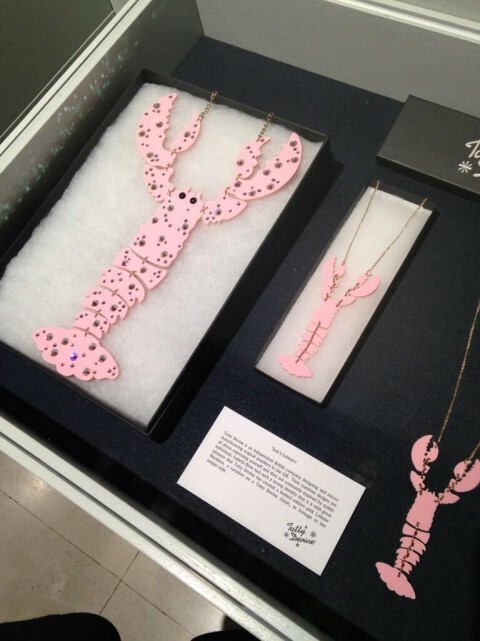 The Lobster Necklace is £40 and the GIANT Lobster Necklace is £180. A very limited number of each has been made exclusively for the exhibition shop at Somerset House, so you won't find them anywhere else. Isabella Blow: Fashion Galore! launches at Somerset House on 20th November and runs until 2nd March 2014.